Over the last year and a half, city sidewalks have been inundated with the latest venture capital-backed trend: e-scooters or electric scooters. Seemingly overnight, thousands of these techy devices sprung up like weeds around Los Angeles. Bird and Lime were the industry’s pioneers, but behemoth transportation disruptors Uber and Lyft have entered into the game as well. LA capped the number of scooters that each company could operate at 3,000, but with tens of millions of rides already recorded in the first year of these companies’ operation, electric scooters are likely here to stay. Although electric scooter companies claim that these devices are an affordable, environmentally friendly mode of short-distance transportation, the question of the safety of e-scooter transit remains largely unanswered—and a point of considerable concern for The Dominguez Firm’s electric scooter accident lawyers. As we begin to see more data on e-scooter accidents and begin to build a broader picture of their impact, it is becoming clear that e-scooter accidents are a real risk to riders—a reality increasingly acknowledged by regulators and lawmakers pushing for greater safety regulations. One study found that during the first year that Bird and Lime scooters were in operation, two Southern California emergency rooms dealt with nearly 249 injuries related to e-scooters. Here’s what you need to know about e-scooter accidents. Those of us who came of age in the early 2000’s (or were parents of adolescents during that time) likely recognize the familiar profile of the new scooters littering our city sidewalks—the design of the devices resembles that of the wildly popular Razor Scooters of the early aughts. Bird and Lime took this classic design and added an electronic motor and an app-based rental system. These devices consist of a narrow floorboard mounted on two wheels, a steering column, handlebars, and electronic motor. Riders stand on the floorboard and use the handlebars to manually steer the vehicle. The scooters can travel up to 35 miles per hour, and while this speed may seem slow, several factors contribute to the risks posed by electric scooter accidents. What are the Risks of Electric Scooter Accidents? City ordinances generally prohibit the operation of electric scooters on sidewalks, forcing riders into the streets or bike lanes. Drivers and cyclists are often unfamiliar with accounting for electric scooters or e-scooters in traffic and may be slow to react when an unexpected scooter rider navigates in front of their vehicle. Riders are especially at risk when a car is making a turn or changing lanes, when the driver’s vision can be most obstructed. Ordinances against sidewalk riding are often loosely enforced, and many motorized and electric scooter riders ignore the restrictions and ride on the sidewalk, setting them up for a possible collision with a pedestrian. Although an electric scooter collision with a pedestrian is less likely to result in serious injuries, a collision with a pedestrian at 15 MPH could still send both the rider and the pedestrian to the emergency room—and possibly result in a serious injury. The primary risks of electric scooters and motorized scooters arise out of a lack of knowledge, and therefor lack of informed regulation over the devices. This technology is brand new, and we just don’t have enough data about how electric scooters are being integrated into the urban traffic-scape, what the risks are, and how to avoid electric scooter accidents. Recent efforts in California to require safety equipment to be used while riding a motorized or electric scooter have so far been unsuccessful—indeed, at the beginning of 2019 a new law went into effect that eliminated a previous requirement that adults wear helmets while operating a scooter. A lack of enforcement of the limited rules that exist governing electric scooter use has resulted in abuses like riding under the influence, piling multiple riders onto a single scooter, and reckless riding. The popularity of these devices among teenagers and young adults, who often exhibit poor judgment, contributes to the electric scooter problem. These abuses put drivers, pedestrians, cyclists, and electric scooter riders themselves at risk of an accident and serious injuries. What are the Laws Governing Electric Scooter Accidents? In Los Angeles specifically, rules passed last fall put considerable requirements on electric scooter companies. These rules also required that riders must park scooters upright near the outer edge of the sidewalk, near a bus bench, parking meter, or advertising kiosk. Who Pays for Electric Scooter Accident Injuries? Who is liable for purposes of insurance or legal claims in the aftermath of an electric scooter accident that resulted in injuries depends on the particular facts of the accident. If the accident was caused by rider error—for example, the rider hit a pedestrian, or was driving recklessly or otherwise disobeying the rules and caused an accident—then the rider is responsible for footing the bill. This can get tricky, since unlike with cars, motorcycles, or mopeds, motorized scooter and electric scooter riders in California are not required to carry insurance coverage. If the rider has renter’s or homeowner’s insurance, you may be able to claim compensation under their coverage. Otherwise, the only option is to file a lawsuit against the rider. If the rider is injured in the accident, then they are responsible for their own medical bills (whether using their own health insurance or paying out-of-pocket). If the driver of a car, motorcycle, or moped caused the accident, their insurance carrier should cover the cost of any injuries. If the accident was due to street hazards or poorly maintained roadways, liability may fall to the city or municipal agency responsible for maintaining the street. For example, if an e-scooter rider hits a pothole and is ejected from the scooter and injured, she may be able to file a claim for compensation from the city. However, some municipalities (like Santa Monica) have compelled electric scooter and motorized scooter companies to include language in their user agreements that release the city from any liability, making such a claim difficult. If a business is responsible for creating a hazardous roadway that results in an accident and injury, for example by improperly placing construction materials in the roadway, the rider may file a claim against the business or their insurance carrier. Because the proliferation of electric scooters sharing is such a recent phenomenon, we don’t yet have reliable statistics on accident and injury incidents. However, anecdotal information from hospitals around the country suggest that motorized scooter and electric scooter accidents pose a growing problem. 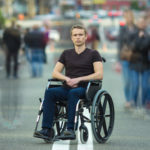 An emergency room in Utah reported that it had treated 21 patients with injuries related to electric scooter accidents between June and September of 2018. Multiple patients reported that they had been intoxicated and not wearing a helmet at the time of their accident. Lime e-scooters were connected to 2 deaths during the month of September 2018. Doctors in seven cities reported significant spikes in severe accidents following the launch of scooter-shares in their cities. In December of last year, the CDC announced that it would conduct its first epidemiological study of scooter usage in Austin, Texas. The information from this initial study will be vital in fleshing out our understanding of the real risks of this wildly popular trend. Although the jury is out on the actual impact of electric scooters on urban traffic safety and rider health, one thing is clear to our electric scooter accident lawyers —accident victims don’t have time to wait for regulators to complete a fact-finding mission. People are being hurt daily, and at The Dominguez Firm, although we can’t prevent the accident that harmed you, we can assist you with legal recourse and compensation. Whether you need a Bird accident lawyer, Lime accident lawyer, or have been injured even in a private motorized scooter or electric scooter accident, our team of experienced attorneys are ready to help you navigate the complicated claims process and get you the compensation you need. Call our offices today at 800-818-1818 for a free consultation about your case. If there is no recovery, there is no fee.